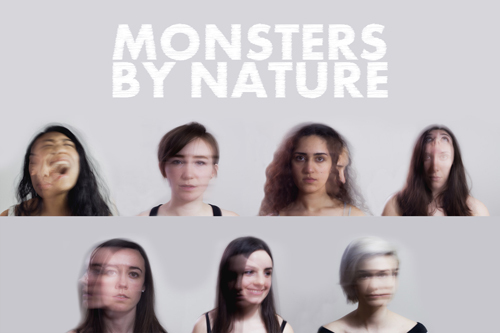 Kindling Collective proudly invites you to their Toronto Fringe Festival debut, Monsters By Nature. Monsters By Nature is a collective creation piece that takes an in depth perspective at the human capacity to commit evils and embrace their inner bestial power. Inspired by the classical tales of Frankenstein, Dracula, Quasimodo and more, you are taken on the journey of the creation of a monster. This project has been in the works for two years and has had contributions from several different creators plus numerous anonymous submissions from our online questionnaire. It features a mix of self-written material and published text, ranging from Jacobean, Elizabethan, to anonymous posts in forums found on the deep dark web. Kindling Collective aims to take an intersectional feminist perspective to classical works. This production’s team features a diverse cast of classically trained female performers and musicians. Co-founders Jilly Hanson, Shannon Murphy, and Chelsea Woodard take the stage along side up-and-coming artists Ellie Posadas, Parmida Vand and Julia Vescio.